August 27, 2012  The Republican convention is delayed a day because of the weather? A perfect opportunity then to solve this week's ScuttleButton puzzle! August 14, 2012  It took Mitt Romney all this time to announce his choice of a running mate. It should take you all of 15 seconds to solve this week's ScuttleButton puzzle. 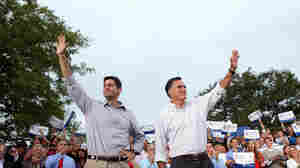 Paul Ryan: Bold Move By Romney, More Ammo For Democrats Or Both? August 13, 2012  Mitt Romney made a risky and daring move in naming House Budget Committee chair Paul Ryan as his running mate. It's a choice that has excited conservatives. But it also gives the White House an opportunity to switch focus from President Obama to the GOP and its plans for Medicare. August 7, 2012  Only two buttons in this week's ScuttleButton puzzle, a perfect solution for those with short attention spans. August 6, 2012  The way we elect a president necessitates that the candidates have to campaign only in the so-called "battleground states." Here is the list of the 10 states that will determine the November winner, and how they voted in the past. July 31, 2012  Once again, doping accusations surround the brains behind the weekly ScuttleButton puzzle. Maybe you should solve it before sanctions are imposed. July 30, 2012  The Tea Party is going all out on Tuesday in Texas on behalf of Ted Cruz, a former state solicitor general who is battling Lt. Gov. David Dewhurst in the GOP Senate primary. July 24, 2012  One category that, tragically, was left out of this year's Summer Olympics: Time It Takes To Figure Out This Week's ScuttleButton Puzzle. 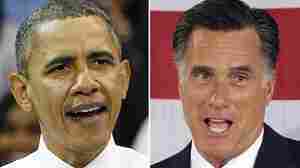 July 17, 2012  Dying to know who Mitt Romney will pick for V.P.? Is that really more important than solving this week's ScuttleButton puzzle? I didn't think so. 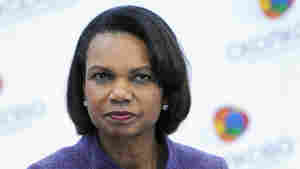 Would Romney, Already Looked At Skeptically By The Right, Pick Rice? July 16, 2012  One of Mitt Romney's problems is that he still faces resistance from some conservatives who don't trust his ideological core. That's one reason why the recent speculation about Romney naming Condi Rice, who is pro-choice, as VP doesn't make sense. July 10, 2012  Nobody would have guessed that the Washington Nationals would be in first place at the All-Star break. Now it's time to guess the answer to this week's ScuttleButton puzzle. July 9, 2012  The Green Party, which is perhaps best known for its former presidential candidate Ralph Nader and the role he may have played in determining the 2000 election, holds its 2012 nominating convention on July 14 in Baltimore. July 2, 2012  The nation still seems split on Obamacare. But how do we really feel about ScuttleButtonCare? Maybe you should solve this week's puzzle to find out.